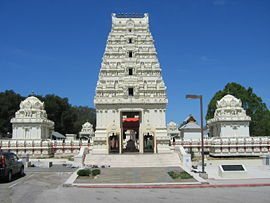 The San Marga Iraivan Temple is a white granite stone Hindu temple sculpted in India and currently under construction on the Hawaiian island of Kauai. The temple is dedicated to the Hindu deity Shiva. "Iraivan" means "He who is worshipped," and is one of the oldest words for God in the Tamil language. The Iraivan Temple is located next to the Wailua River and five miles (8 km) from Mount Waialeale. 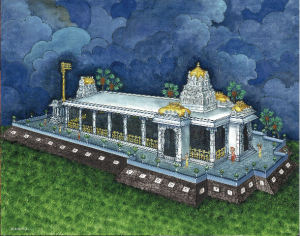 It is the first all-stone temple to be built in the United States. It is maintained by the Saiva Siddhanta Church, also known as Kauai Aadheenam and Kauai's Hindu Monastery. Sri Trichy Mahaswamigal of Kailash Ashram, Bangalore, describes the temple's importance: "The Iraivan Temple is going to be to America what the temples of Chidambaram, Madurai, Rameshwaram, and other great Siva temples are to India." * that it be entirely carved by hand, without the use of any machinery. The temple design was completed by Dr. V. Ganapati Sthapati in the late 1980s. Carving of the 3,000-plus blocks of granite commenced in 1990 at a worksite in Bangalore, India. Beginning in 2001, the stone were shipped to Kauai and assembly begun by a team of silpi temple carvers under the direction of a master architect or sthapati. The 3.2 million pound temple is expected to be completed in 2017. The priests are situated and live on the grounds of the temple. The temple has many gatherings for ceremonies, and provides numerous space for meditation, picknicking, it has a full stage for special cultural and Hindu programs. The Hindu temple has two complexes - the upper complex with Lord Venkateswara as the presiding deity and the lower complex with Lord Shiva as the presiding deity. In addition to the presiding deity, both complexes have shrines for other deities. The temple is open every day of the year. Weekdays: Summer hours: 9:00 A.M to 12:30 Noon and 5 P.M to 8 P.M.
Winter hours: 9:00 A.M to 12:30 Noon and 5 P.M to 7 P.M.
Grand Dushahra festival celebration began about 12 years ago in 1998 when Mr. Mangal Gupta (founder , Indo American Festival ) saw the culture gap that was felt by the Indian community. Mr. Gupta wanted every Indian/ Indian descendent child to know about the great epic of Ramayana & inculcate the virtue of victory of good over Evil in their hearts. 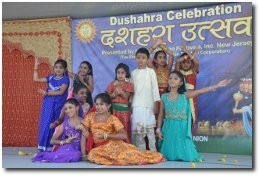 Now, after 12 successful years, the community feels good that someone did it when kids themselves ask their parents the story of Ravan & Ram after coming back from Dushahra & viewing Ravan dhahan. He envisioned and has been successful to make this event a free event so Kids can come & learn, enjoy and connect to the community. One of most exciting moments in life is when one gets their first admission letter from a foreign university. Its a very exciting moment for most because it may be their first trip to a foreign country, possibly their first time away from home on their own and also may be the start of a long and successful future. The moments of joy slowly start to turn into bouts of fear - what do I do, where do I stay, what is the weather like, what is the cost of living etc. 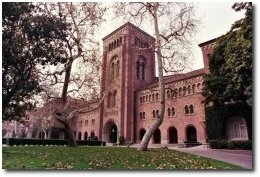 As more and more Indian students have gone abroad to study, they have formed Indian Student Associations that help students with these very questions and also help them settle down once they arrive in this new country. Getting in touch with someone from the Indian Student Association is a great way to calm the fears of making this huge change in ones life. Videsh.com has diligently searched the net for Indian Student Associations around the world. We have found over 200 such associations and are constantly adding more to our list.